For the third time in 12 months, the FHA is changing its mortgage insurance costs. Effective for all FHA case numbers assigned on, or after, April 18, 2011, annual mortgage insurance premiums (MIP) will increase 25 basis points. The change will add $250 to an FHA-insured homeowner’s annual loan costs per $100,000 borrowed, and applies to all borrower’s equally. Current FHA borrowers are unaffected. 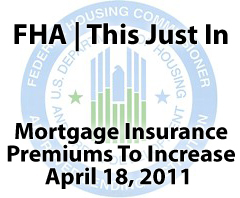 To understand the FHA is to understand why premiums are rising. As an institution, the Federal Housing Administration plays a much larger role in the U.S. housing market today than it did just 5 years ago. According to its own records, the FHA’s percentage of purchase money business nationwide expanded from 4 percent in FY 2006 to 19 percent in FY 2010. Rapid growth like this has strained the FHA’s capital and, indeed, in its official statement, the FHA alludes to this, stating that the MIP increase will “significantly strengthen” its reserves. By law, the FHA must maintain a certain minimum level of reserves. To calculate your monthly mortgage insurance premium, multiply your starting loan size by your insurance premium, and divide by 12. There is no change planned to the 1 percent upfront mortgage insurance premium charged by the FHA.